Apple’s newest and thinnest laptop, the MacBook, has a keyboard with a mechanism in which its keys have nearly no depth, meaning that the device can be thinner than ever. But Apple might be considering killing off the laptop keyboard entirely, and moving to a completely flat touch surface, according to a patent it filed last fall that was published on Thursday. The invention, a “configurable, force-sensitive input structure for an electronic device,” describes a way to interact with an electronic device. The patent’s pictures show a laptop like a MacBook. Essentially, Apple’s experimenting with “zero-travel” inputs. A touchscreen, for instance, is a zero-travel input: When you press on it, there’s no physical mechanism that moves. But the invention published on Thursday is more like the “Force Touch” trackpads that Apple has included on recent MacBooks that rely on haptic technology. Instead of clicking, a layer senses the force that the user’s fingers impart to the surface and when pressed down, instead of the trackpad actually moving, a small motor provides a sensation as if you’re actually clicking. 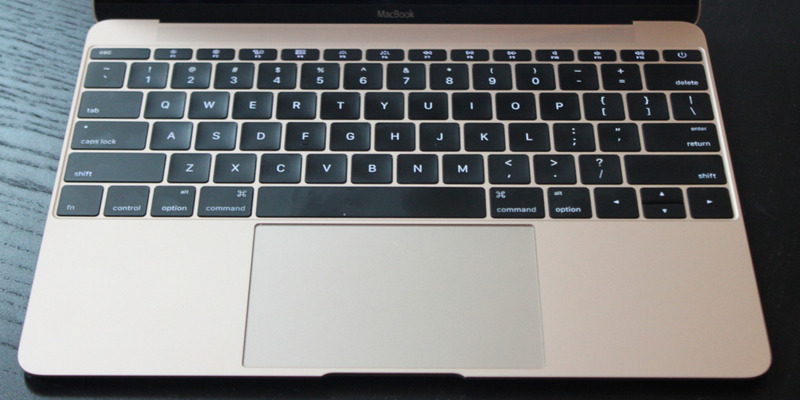 So instead of keys, a future MacBook could have a flat surface that you can type on. Business InsiderThe latest MacBook with a Force Touch trackpad. This patent takes that idea to the next level, and seems to indicate that this kind of haptic technology can be configured for a laptop keyboard, a number pad, or a track pad, all with the same general input structure. Furthermore, the positioning of these haptic keypads can be configurable — so your laptop might have a number pad for Excel sessions, and switch to a game pad for playing games. Apple even says that “micro-perforations” in the casing may be able to light up to give the user the guidelines of a keyboard, for instance, without the battery drain of a full touchscreen.